In this meditation method, you will be able to acquire not just the basic knowledge regarding walking meditation, but extreme power to uplift yourself and your inner experience and sensation beyond tradition and definition. 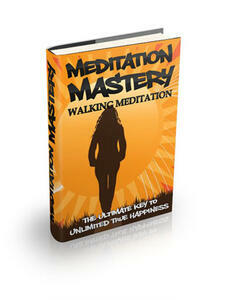 Walking meditation is usually understood as primarily intended to relieve stress in the legs. While it has this effect, this is not the only meaning of kinhin. During sitting, the legs may turn numb, or 'go to sleep'. This does not mean that the circulation is bad, quite the opposite. There is an old saying in Zen, "A fire that begins in your toes and consumes your whole body"- this is the meaning of this numbness. The smallest thing- even the legs going to sleep- is a subject of investigation in our Zen training. An ancient questions asks, "can you make your body as limp as a baby's?" When your legs and feet are numb, you will notice that your ankles are usually flexible. Once when I was having private Dokusan with my Zen master, the late Reverend Dr. Soyu Matsuoka-roshi, Archbishop of Soto Zen North America, which consisted to two normal sitting periods of one hour with Kinhin and no talking- both legs had gone completely to sleep by the ending gong. When I stoop up, both feet were absolutely buzzing in my socks. As I stepped to the altar, the toes of my right foot dragged on the carpet, and folded under to where I was partially standing on the top of my foot. I nearly fell down! Sensei caught me. It woke my foot up, but it didn't hurt. Kinhin is the extension of the stillness of zazen into the action of walking. In your mind, you should strive to eliminate any distinction between the two- they are more alike than different. There is a famous Zen saying, "Stillness in Action- Action in Stillness". We have this calligraphy by the late Reverend Dr. Soyu Matsuoka-roshi of this expression. It also connotes "Silence is Thunder- Mokurai." This is the more essential meaning of walking meditation- it brings the strength of meditation into the everyday act of walking. It is also symbolic of the Buddha's walking round and round the bodhi-tree following his Enlightenment. So it likewise represents your 'wandering about in the world of enlightenment', in the words of Dogen-Zenji, the founder of Soto Zen Buddhism, for the first time.